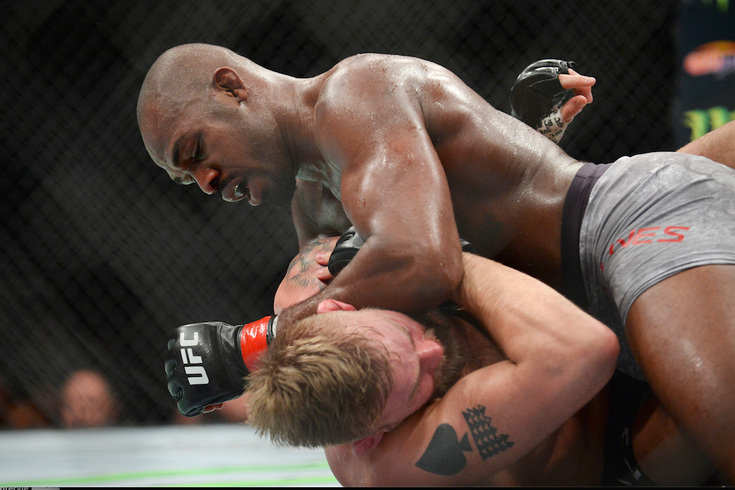 Jon Jones (red gloves) fights Alexander Gustafsson (blue gloves) during UFC 232 at The Forum in Los Angeles on Dec. 29, 2018. For the first time since 2011, the UFC will return to Philadelphia. The Wells Fargo Center announced Tuesday that a "Fight Night" event will be held in South Philly on Saturday, March 30. The fight card and ticket information have yet to be released. The last time the UFC held a major event in Philadelphia was UFC 133, which featured Rashad Evans' defeating Tito Ortiz in two rounds. A potential return to Philadelphia for a major event seemed possible in 2016, as homegrown fighters Eddie Alvarez and Paul Felder both advanced up the ranks at the time, but it never came to fruition. Part of the reason for the UFC's long absence has simply been the high global demand from new venues as the sport continues its international expansion. While "Fight Night" isn't one of UFC's major numbered events, the return to Philadelphia is a long time coming. "Philadelphia is a legendary fight town," UFC President Dana White told PhillyVoice in 2016. "Whether you're talking about its history in boxing with guys like Joe Frazier and Bernard Hopkins or MMA with UFC stars like Eddie Alvarez and Paul Felder, Philly is a city defined by toughness, and famous for its food and die-hard sports fans."